The Ecocapsule is an egg-shaped, mobile dwelling that utilises solar and wind energy. It was developed by Nice Architects, a firm based in Bratislava, Slovakia. Shaped like an egg to minimize its surface-area-to-volume ratio, its walls are made of two layers of fiberglass with polyurethane foam sandwiched in between. Nice Architects describes the Ecocapsule as a "low-energy house packed into a compact form", although other potential applications include as a disaster-relief shelter, a scientific research station, and even as a "remote Airbnb". Weighing 1.7 metric tons (1.7 long tons; 1.9 short tons) and measuring 4.7 meters (15 ft) in length by 2.2 meters (7.2 ft) in width by 2.5 meters (8.2 ft) in height, the 86-square-foot (8.0 m2) Ecocapsule is designed to accommodate two occupants. In addition to providing sleeping quarters for two with a folding bed, it also includes a kitchenette, a shower, a fold-out table, working windows, and even storage space. 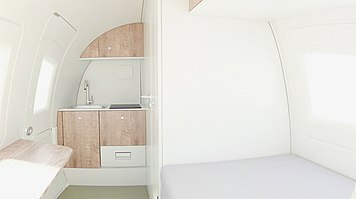 The Ecocapsule's interior, described by Devin Coldewey as "futuristic but warm", is bathed in natural light and predominantly white in color with blond wood accents. The Ecocapsule is powered primarily by a built-in, 750-watt (1.01 hp) wind turbine and secondarily by a high-efficiency, 880-watt (1.18 hp) solar cell array. It is designed to produce more energy than it consumes, as long as the external temperature remains between 4 °F (−16 °C) and 104 °F (40 °C). The dwelling is also equipped with a 9,744-watt-hour (35,080 kJ) battery that can hold four days worth of electrical charge. If the battery is charged, the Ecocapsule diverts some of the energy captured by the solar cells to supplement its water heater. Other energy-conservation features of the dwelling are its high-efficiency climate control system and a heat exchanger that uses exhaust air to warm fresh incoming air. The Ecocapsule also harnesses rainwater with its 25.3-US-gallon (96 L) reservoir, which is located beneath the dwelling's floor. The water is cleaned via a pre-filtration system and two UV LED lamps. Drinking water is also provided by filters installed on the faucets. The Ecocapsule also features a waterless separating toilet. The Ecocapsule has a central computer that monitors its electricity and water levels, and can be controlled via a mobile app. The app is also used for controlling all important aspects of Ecocapsule. 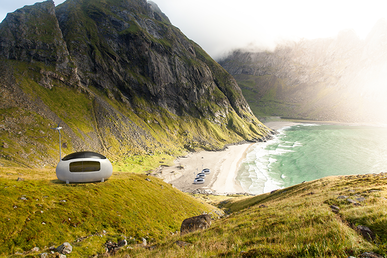 According to Nice Architects, the Ecocapsule should allow its occupants to live off the grid for several weeks to several months. On May 28, 2015, the Ecocapsule was publicly unveiled at Vienna's Pioneers Festival after six years of development. By July 2015, thousands of pre-orders had already been made and interest generated among celebrities such as Susan Sarandon. In January 2018, the company Ecocapsule launched the production of the First Series Ecocapsules, limited to 50 pieces. They have also announced the production of the more affordable, mass-produced Second Series Ecocapsules, with the planned launch in the second half of 2019. 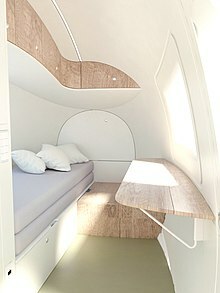 The price of a First Series Ecocapsule is €79,900. The price of the Second Series Ecocapsules is to be announced in 2019. The shipping costs from Slovakia to New York City are around 3,000 euros (about US$3,500), and to Melbourne around 2,500 euros (about AU$4,000). In addition to being shipped, the dwelling is also designed to be transported by airlifting and towing. ^ a b c d e f g h i j Iozzio, Corinne (September 3, 2015). "Ecocapsule Provides A Hub Away From Home". Popular Science. Retrieved October 25, 2015. ^ a b c d e f Franco, Michael (May 22, 2015). "Live almost anywhere on Earth in futuristic Ecocapsule". CNET. Retrieved October 25, 2015. ^ a b c d "Ecocapsule: Dwelling with the spirit of freedom". Nice Architects. Retrieved October 25, 2015. ^ a b c d e f g h Epstein, Adam (May 27, 2015). "Portable, solar-powered ecocapsules mean you can live rent- and electric-bill free, globally". Quartz. Retrieved October 25, 2015. ^ a b Xie, Jenny (May 28, 2015). "This Wind and Solar-Powered Portable Tiny Dwelling Promises the Ultimate Getaway". Curbed. Retrieved October 28, 2015. ^ a b c Monks, Kieron (July 14, 2015). "Egg-shaped home powered by sunlight and wind lets you live anywhere". CNN.com. Retrieved October 25, 2015. ^ Coldewey, Devin (May 22, 2015). "Live Off the Grid in This Solar-Powered 'Ecocapsule' Pod". NBC News. Retrieved October 25, 2015. ^ de Looper, Christian (August 17, 2015). "The Egg-Shaped Ecocapsule Is Now Entering Production Phase". Tech Times. Retrieved October 25, 2015.